Did you know - in one day, we create 1.5 billion pieces of content? With the bombardment of articles, blogs, white papers by businesses, people seem to have become desensitized towards static content. In fact, Content Marketing Institute reveals that over 58% marketers believe that their content does not create opportunity for engagement. People now look for and essentially demand content that yields enough power and substance to get them involved, engaged and entertained, in equal measures. The competition on the web has become fiercer making marketers believe that creating content that can summon apt attention and interest from their target audience with their existing content is difficult, even downright impossible. But things aren’t that bad! All you need to do is to use your existing content and present it in a fashion that it takes elements of your brand and showcase those elements to the world in a way that’s even more awesome. Yes, we're talking about repurposing your static content. Repurposing is an art that involves restructuring and molding old content to provide valuable information in an easier, engaging and entertaining way. Just add value to your old content and save on a lot of business time, efforts and energy. According to an article published in Curata, 69% of content marketers cite lack of time as their marketing challenge. Therefore, repurposing gives you an opportunity to pull together great content in time crunch. You can repurpose your content into any form – infographics, slides, videos etc. 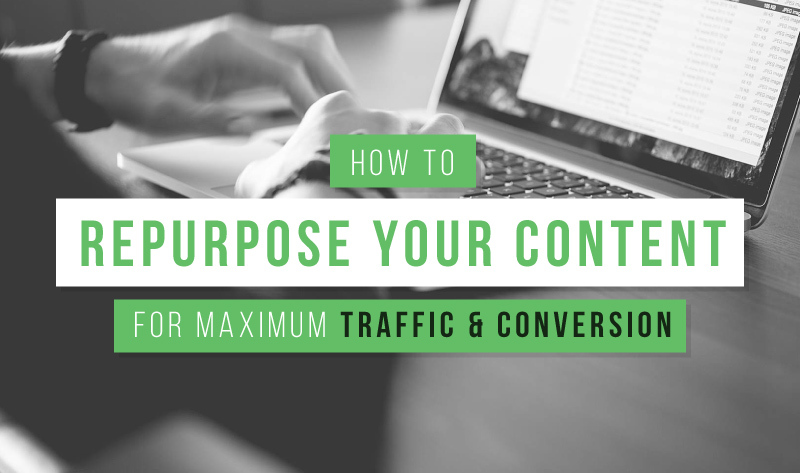 Through this article, we will see how effectively you can drive your modern marketing machine with the fuel of repurposed content and drive maximum traffic and conversion for your brand. But before we proceed, let's first quickly understand the need of repurposing. Improved SEO – As you repurpose your content into different forms and with specific keywords, your search engine rankings tend to improve. The reason for this is that with more content on same topic or with similar keywords, your chances of appearing on the first page of the search engine increases. Broaden Your Reach – Different people have different ways of consuming content. While Tom could like visuals more, Jerry may like statistics. Repurposing ensures that your content is available to a larger audience in the mediums they like. Highlight Your Message – Repurposing content gives you an opportunity to once again highlight your message, if someone had missed it the first time you had published it. Increasing Conversion Rate – Repurposing your existing content assets into interesting, new formats will help you create opportunity for more user engagement. The more engagement you’ve on your website, the more will be chances of conversion. No wonder, a fair share of marketers looking for conversion rate optimization often start by repurposing their existing, evergreen content. According to brainrider.com, people only remember about 20% of what they read but retain about 83% of what they learn visually. And an infographic is a visual delight for the readers. Infographics have the power to capture the attention of your readers as they are easy to scan and view. If you cannot grab your reader's attention, it is impossible that you convert them into customers. Through infographics, you can present even an otherwise complex issue in a simple and easy-to-understand manner. If you have more of stats in your content, it is icing on the cake. Stats and graphics make infographics more interesting. According to Jeff Bullas, “Since just prior to the start of 2010 to the beginning of 2012, infographic search volumes increased by over 800% in just over 2 years.” For example, check out the following infographic by Theinfologist and I'm sure you won’t be able to take your eyes off it! These days, tools such as Venngage are available online to help you make infographic designs. Try once, it's actually simple! You can very well use your old articles as the basis for creating presentations that attract your audience to the limit that they are compelled to buy your product or services. Slides give you a chance to present your content in an easy-to-read way with only small pointers. You can add images in your slides to make them attractive or use graphs. And these days, making a presentation or a slideshow isn’t that difficult. With SlideShare, you can create slides on a particular topic or information. An article published in Huffington states that SlideShare is one of the top 150 most highly-trafficked sites on the web, receiving 60 million visitors and generating 3 billion slide views every month. Do you also eagerly wait for the next episode of a Suspense TV Show? If yes, you already know what we are going to talk about in this part of the article. Presenting your content in episodes, along a proper plotline, leverages anxiety amongst readers to know more about the character or product or service. They actually wait for the next episode and sometimes even discuss it with their friends and family on what will happen next. However, to develop this interest in the readers, you need to ensure that you have a clear idea of what you’ll be covering over a particular time frame. For instance, check out The “Crossroads” series by Coca-Cola that has attracted countless people worldwide. You must have heard, old is gold. In this case, your old can actually turn to be something really beneficial for you. You can simply repurpose the old content that you have by adding updates (if any) or by making additions and publishing it as a new one. And this trick seems to have many advantages! First, you save on your business time for writing a new content. Second, while you publish your updated article, people who had missed it earlier will get a chance to read. And third, it will improve your SEO rankings as you will be able to publish more articles with specific keywords. By updating and resurfacing your evergreen posts, you tend to extend the life of your best blog content as search engines such as Google, Bing or yahoo look at how often you are publishing new content on your website and if you are updating old content. Ace marketer, Daniel Louis reveals in a blog that Google gives credit to sites that publish articles frequently. You must have noticed that Google highlights dates in search results, especially for searches where dates matter. And people obviously prefer to read articles that are dated. Though last, I like this point the most. Just as a picture is worth a 1,000 words, a one-minute video is worth 1.8 Million words. These stats clearly indicate the impact of videos on consumers as well as marketers. Repurposing your old content and turning it into a video can increase your leads considerably. A video uploaded on You Tube will reach a larger audience than any other medium. Making an interesting video is all that it will take. All you need to do for making a compelling video is that note down all the key points in your piece of content and talk about them in the video in a conversational and engaging manner. You can talk to your visitors directly. Recording a video is one of the easiest ways of putting your message across the readers. However, don’t forget to link your videos to other articles, infographics, Slides, etc. on the same topic. There are tools such as Mindflash, Knoodle, Jing, Screenr and Camtasia that convert presentations, PDFs and other types of content into video. For instance, check out this video by Amy who puts her point across by acting out the characters in her videos. There will be many other ways for repurposing your content but the above mentioned ones are the most essential (and easy) ones. An article published in CMO explains that 69% of content marketing lacks quality. Therefore, ensure that the content you create, in whichever format, is of high quality. It is something you cannot compromise with. Repurposing your content across different mediums is the best way to attract a new set of audience and eventually increase leads. And the best part is that you don’t have to spend your fortune in doing so. Therefore, next time you think of creating a new article for your business, just pick up one of your older posts and repurpose it to give it a new lease of life. The suggestions given in this post will surely help you to save money as well as time. However, don't spread yourself too thin -- it is better to create two or three of these types of content strongly rather than having mere presence across all other mediums. Daniel is the Chief Marketing Officer at TruConversion.com with both startups and enterprise clients have given him unique perspective and ability to connect the dots for brands of all sizes. He loves writing on content strategy, marketing, and optimization initiatives.